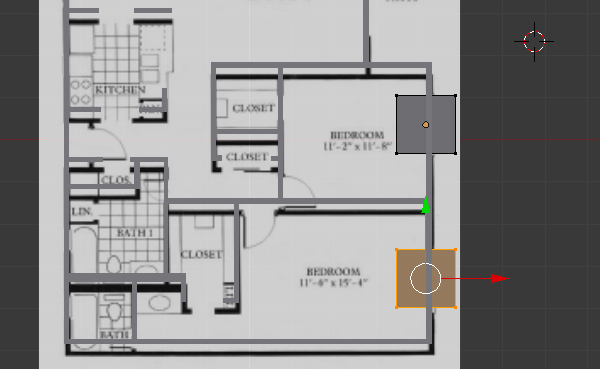 In this tutorial you’ll learn how to create a 3D floor plan model from an 2D architectural drawing. 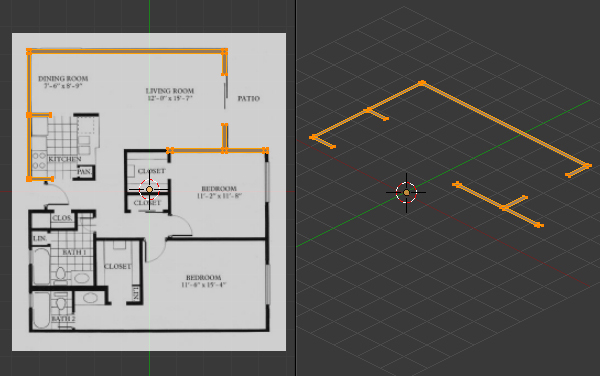 Karan Shah will show you some simple, yet effective techniques for constructing the walls, windows and doors following a basic interior schematic in Blender. 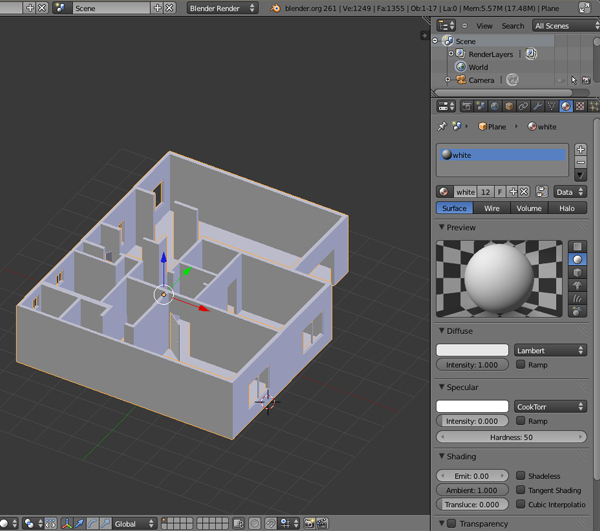 With the model complete we’ll add materials and textures, and do a final render of the scene. 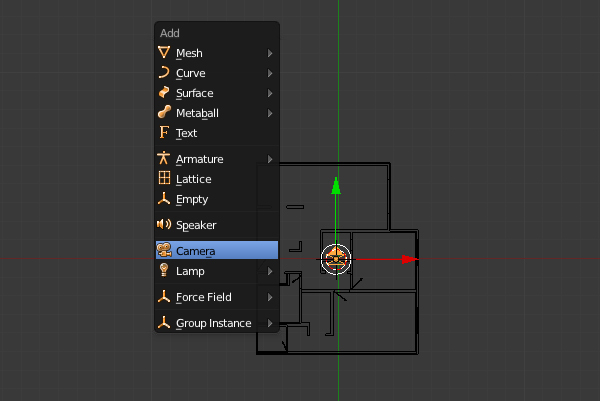 In a new file, select all objects with the ‘A’ key and press ‘Del’ to delete them. Press ‘N’ to bring up our View properties. In the Background Image Panel, add your reference image. Here I have used image courtesy ofLiamKeiranCooper Ltd who kept the picture in public domain. Press ‘7’ on the NumPad to get into the Top view. Here you can see the background image. The view must be set to ‘orthographic’ in order to see the image. You can toggle between the ortho and perspective views with the ‘5’ key on the Numpad. Press Shift+A and add a Plane. Now we will cover all the black solid areas i.e. the walls. This will include the windows as they are part of the walls and will be added later. 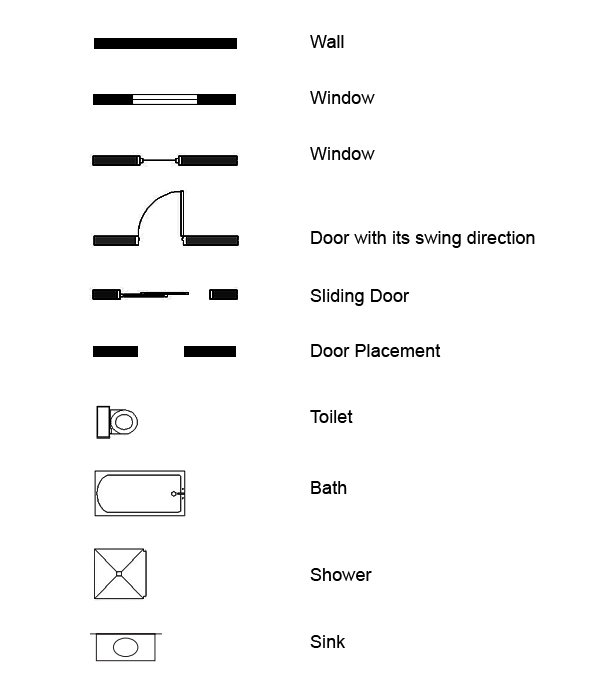 Any type of door whether it’s a slider or normal, is to be left out. 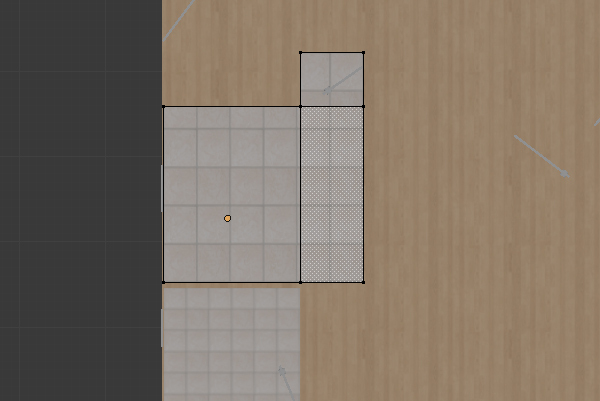 Select the bottom two vertices (press ‘B’ to drag select or Hold ‘Shift’ and Right click for multiple select.) And move them down just before the wall turns left. 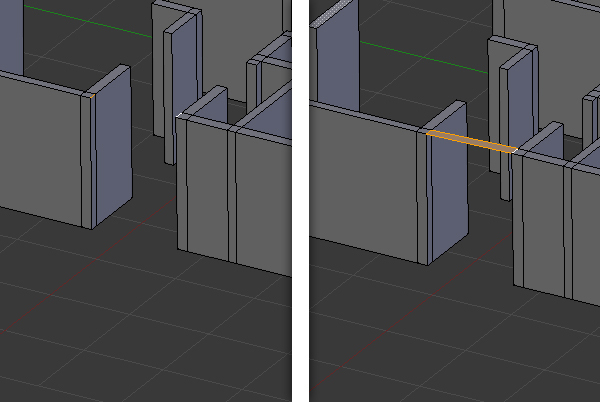 Press ‘E’ and extrude the wall again until you reach the edge. 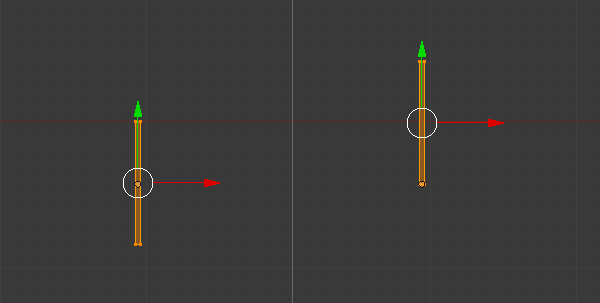 Select the right two vertices and press ‘E’ to extrude, and match the reference. 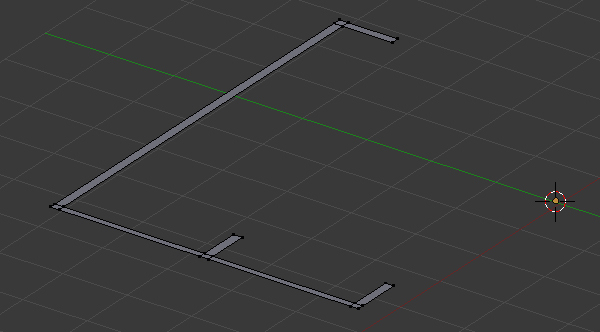 Now, in order to extrude out a face from the middle, we need to add an Edge Loop. Hover your mouse over the face, and press ‘CTRL+R’ and Left Click to confirm. Move the mouse up and down and then Left click again to confirm its position. 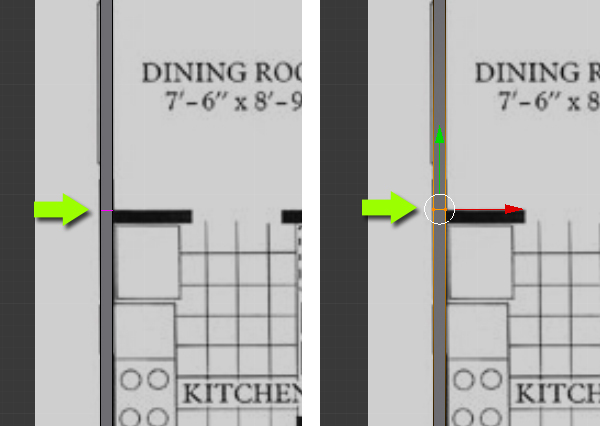 Create another edge loop just below the previous one using the same method, matching the width of the wall to be extruded. Select the two vertices and extrude the wall. 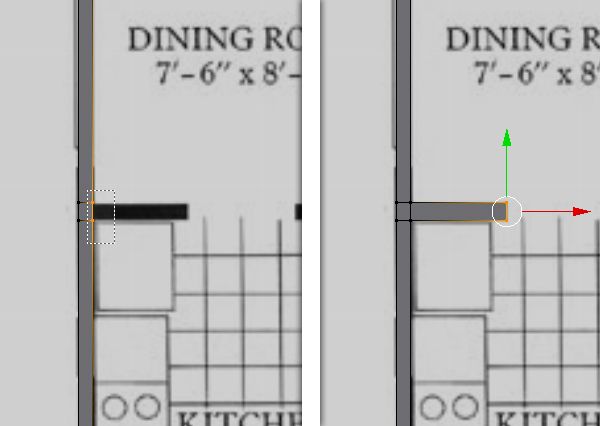 Create another edge loop on the corner and extrude the right edge. 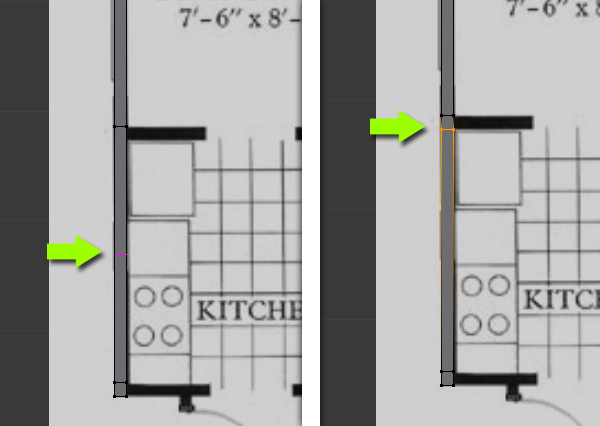 Using the techniques above (extrude and edge loop division) fill all the solid black lines of the reference image with the mesh. 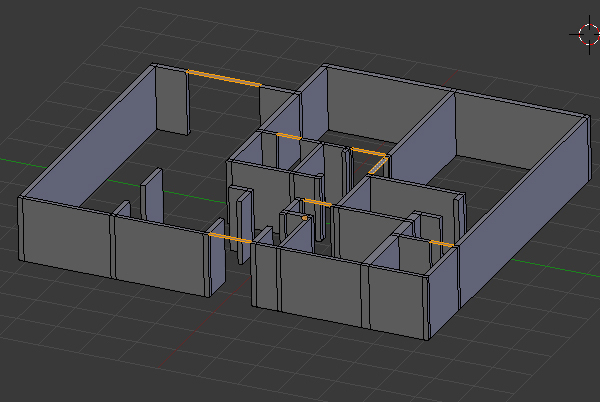 To start a new separate wall, duplicate the last edge and then start extruding it. Select the last edge and press ‘Shift+D’ to Duplicate it, and left click to confirm. Move it with the Move control widget or press ‘G’ key of the keyboard. 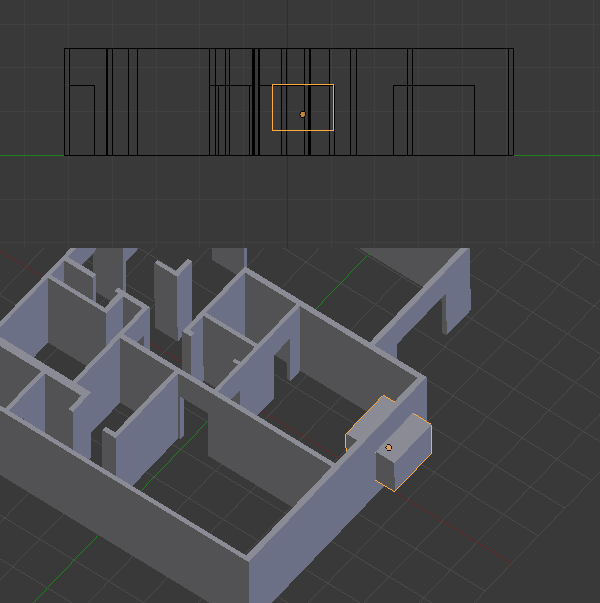 And continue extruding the mesh along to match the reference. Complete the walls with the techniques you learned from above steps. 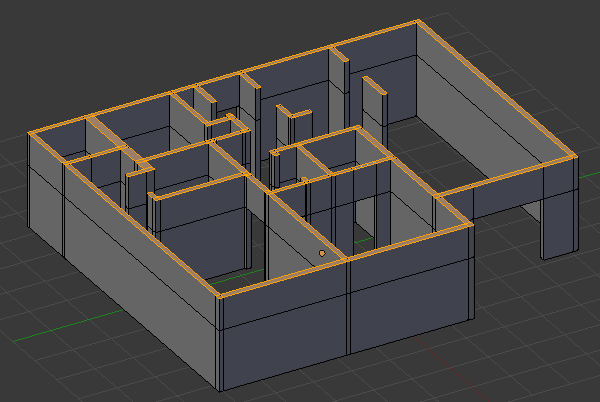 After completing the wall, select all the vertices and then press ‘E’ to extrude them along the Z axis. Now we see that the structure is taking shape. 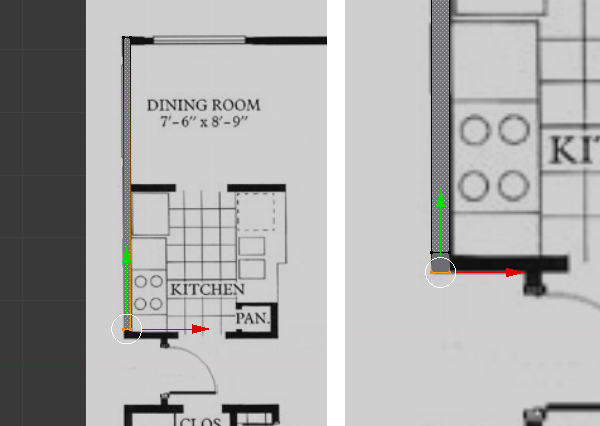 The height should be equivalent to a door. 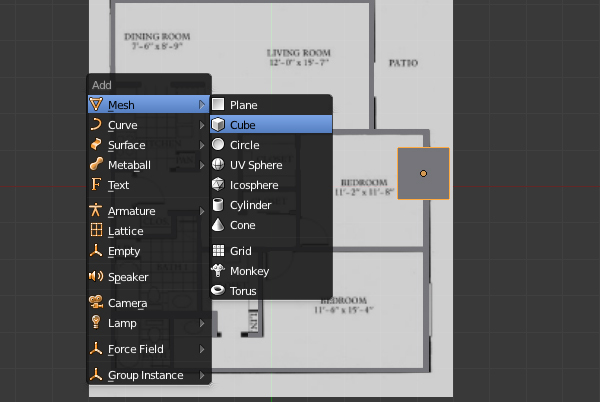 Press ‘Ctrl+TAB’ and select ‘Edge’ in the mesh select mode menu. 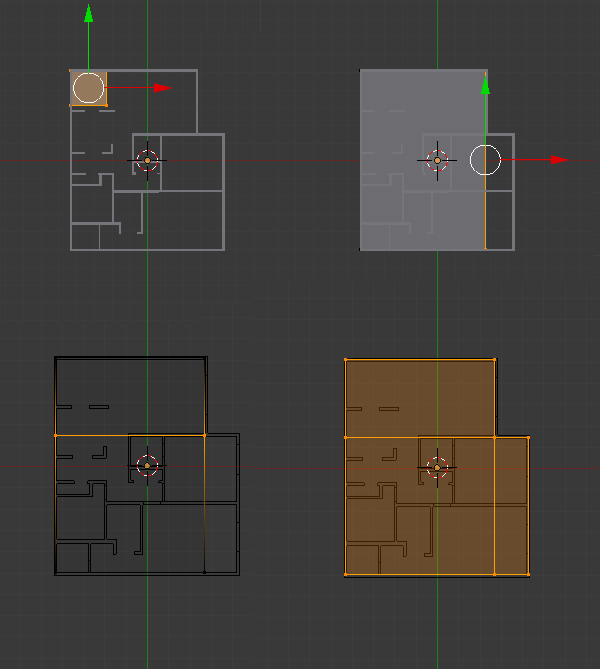 Select the top two corner edges of a door (hold shift + right click to multiple select) and press ‘F’ to make a Face between them. Do this for all doors. Refer to your image and always check from all views. 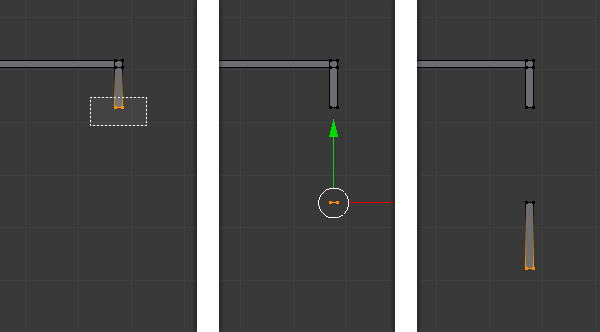 Press ‘3’ on the Numpad to get into side view, and Press ‘Z’ to get into wireframe view so that we can see all the vertices behind are visible and can be selected. 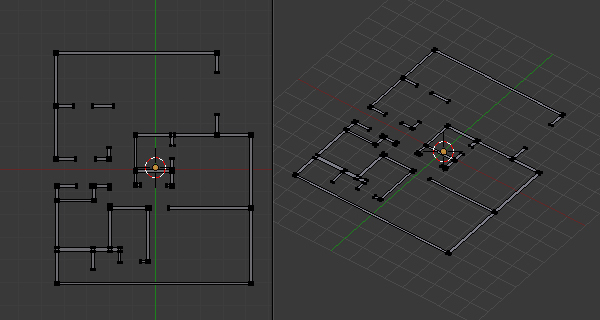 Press ‘B’ to drag select all the top vertices or edges, then Press ‘E’ to extrude them. This will reach the final height of the wall. Now we will place the windows. 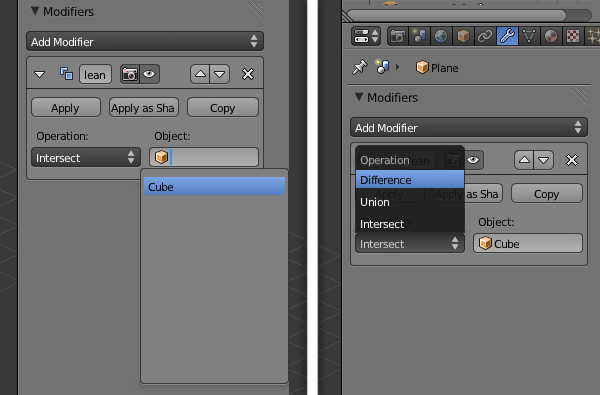 Press ‘TAB’ to get out of the Edit mode, and in object mode, press ‘Shift+A’ and add a ‘Cube’. 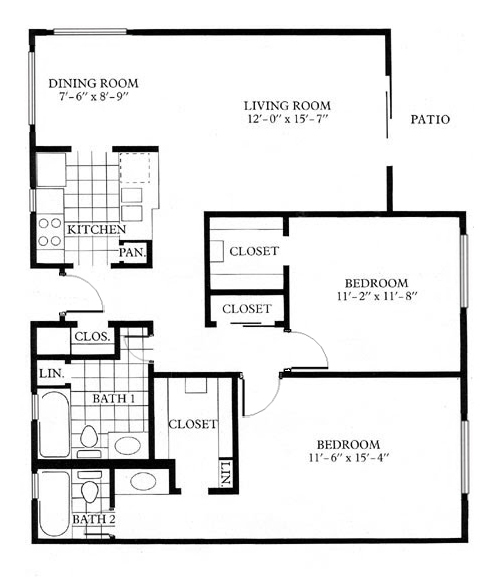 In the Top view, size (press ‘S’ to scale) and place it where the window is on the reference image. In the side view, the top part of window should align to the top of door. 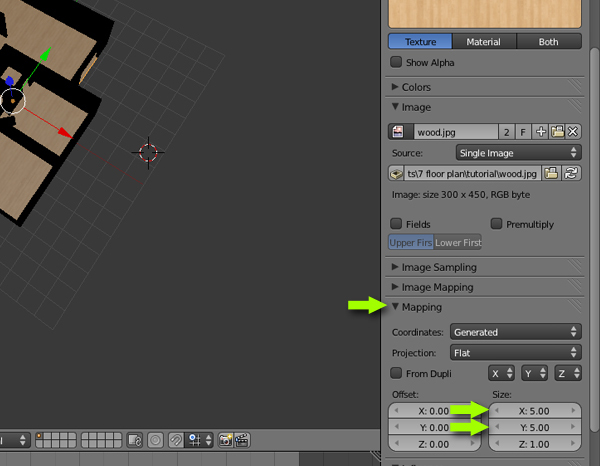 Press ‘TAB’ to enter into the edit mode to adjust the vertices. Adjust the bottom height of the window too. The width of the cube should be such that it should be half inside and half outside. See image below. 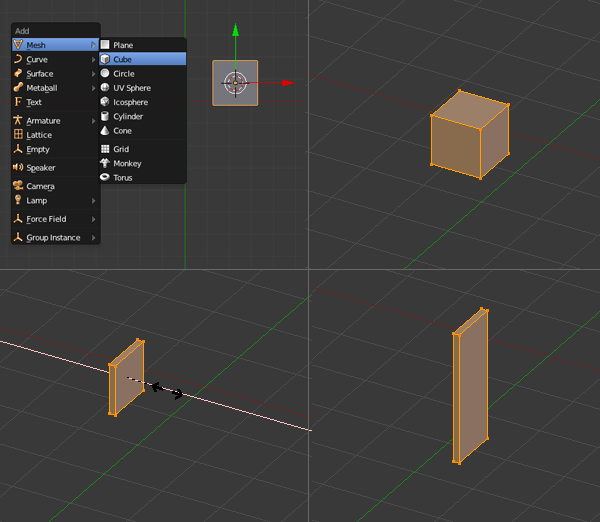 Select the Wall mesh with Right click, and in the Properties button window, click on ‘Object Modifiers’. Click on ‘Add Modifiers’ and select ‘Boolean’. 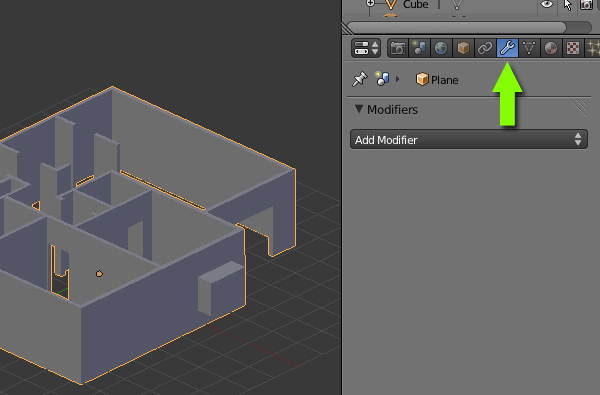 In the Boolean modifiers panel, select ‘Cube’ in the Object, and ‘Difference’ under ‘Operation’. To see the effect – Select the cube and press ‘H’ to hide it. You will see that there is a “hole” in the wall the size and shape of the cube. Press ‘Alt+H’ to ‘Unhide’ the Cube. 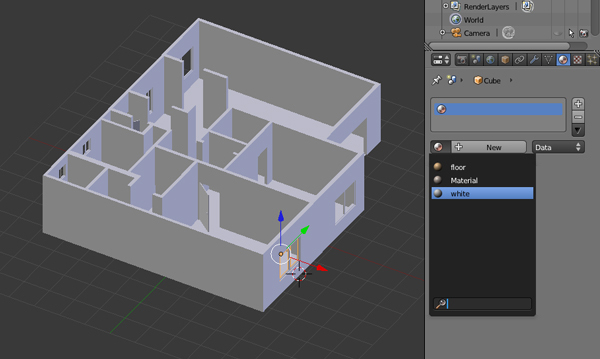 Now select the Cube (window) and in the ‘Edit’ mode, select all the vertices and press ‘Shift+D’ to make a duplicate. Place this new cube in the location of the next window. 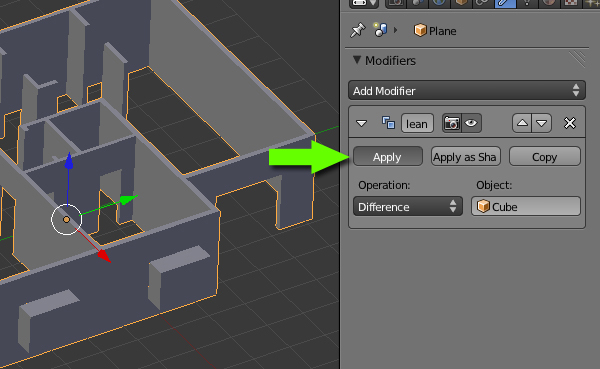 Now press ‘Tab’ to get out of ‘Edit’ mode, and select the Wall mesh and press ‘Apply’ in the ‘Boolean’ Modifier panel. The holes are now part of the geometry. Move the Cube to see the windows. 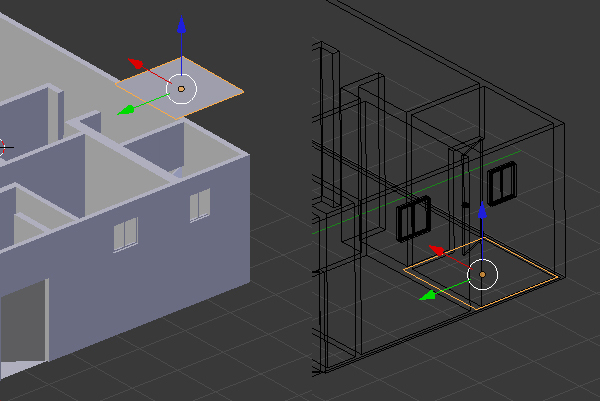 Similarly create all the needed windows with this Boolean modifier. Try doing them one by one, adjust the size and position of the cube according to the specific window. Now we will create the Floor. 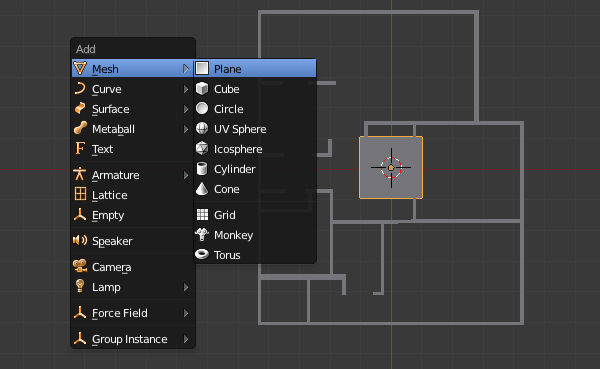 In ‘Object’ mode and in the Top view, press ‘Shift+A’ and add a ‘Plane’. 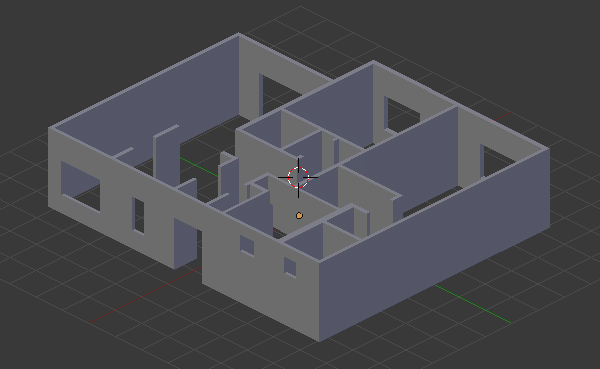 Press ‘Tab’ to get into ‘Edit’ mode and adjust the vertices accordingly so that it covers the walls. Create Edge Loops or Extrude the edges where necessary. Make sure that there are no gaps between the edges of the floor and walls. 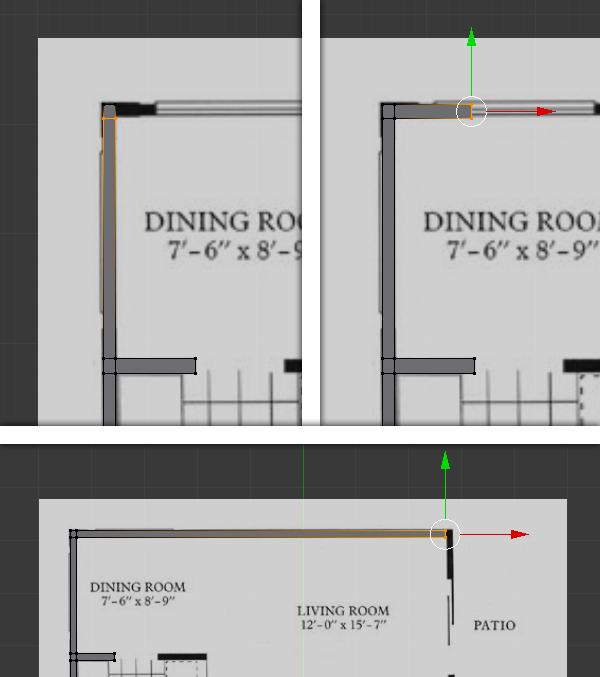 Also in the Side view, move the floor down so it’s aligned with the bottom of the walls. In the Top view, and in ‘Edit’ mode. 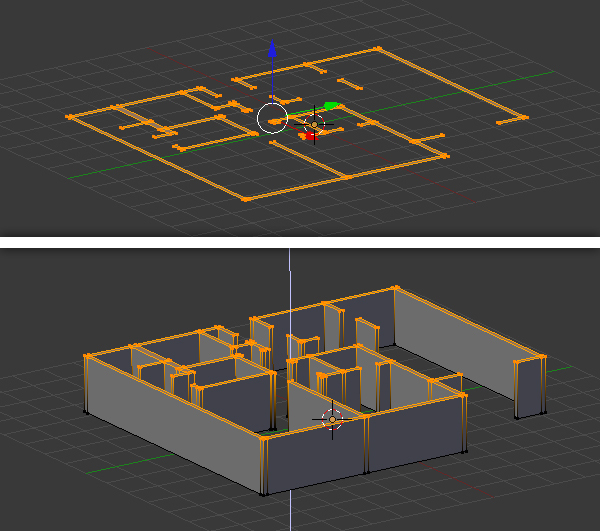 Move all the vertices of the door along the Y axis, so that the center point of the object (orange dot) should be at the corner (see image.) 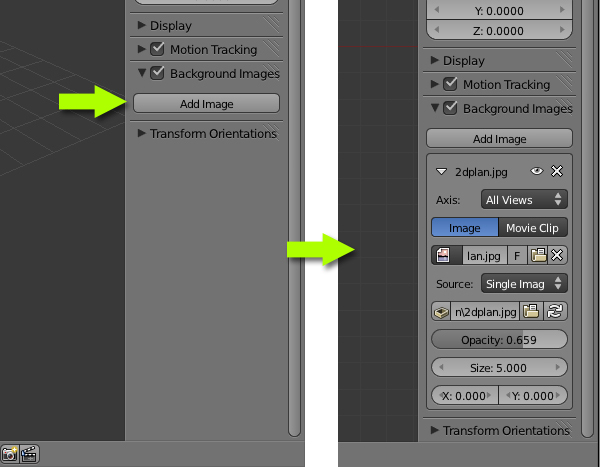 This will set the transform orientation of the object from that corner. Press ‘TAB’ to get out of edit mode and then press’R’ to Rotate and see the difference. 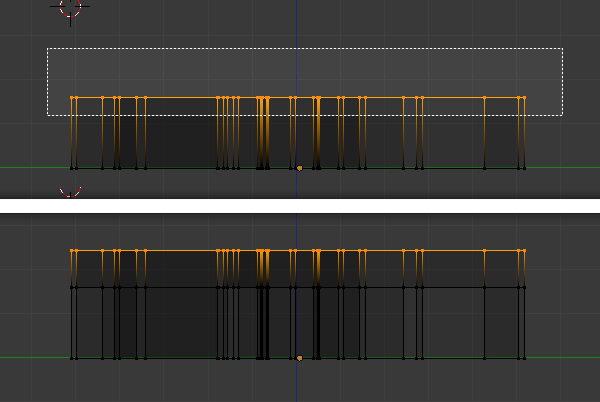 While in the edit mode, add a new ‘Cylinder’. 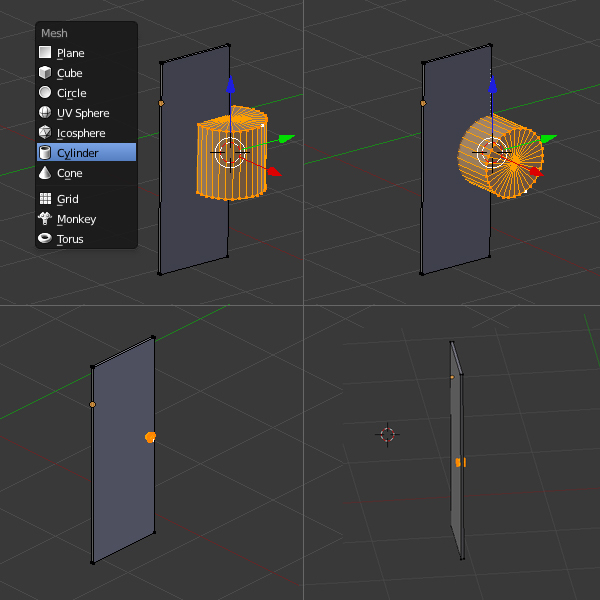 Rotate and scale it down to create the doorknob (you can add more details if you like.) Press ‘TAB’ to get out of edit mode. 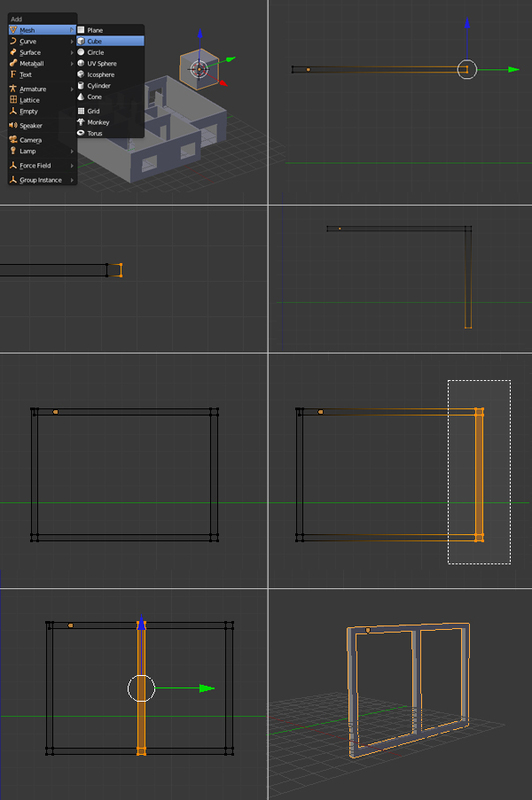 Now we will create the window frame. Start with another new ‘Cube’, and press ‘TAB’ to enter into ‘Edit’ mode. 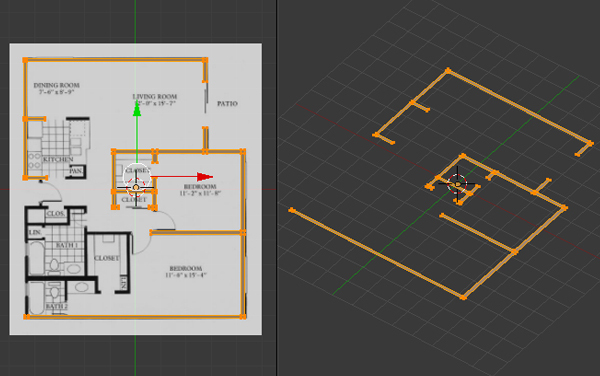 Press the ‘Z’ key to toggle wireframe view, so that we can select the back vertices too. 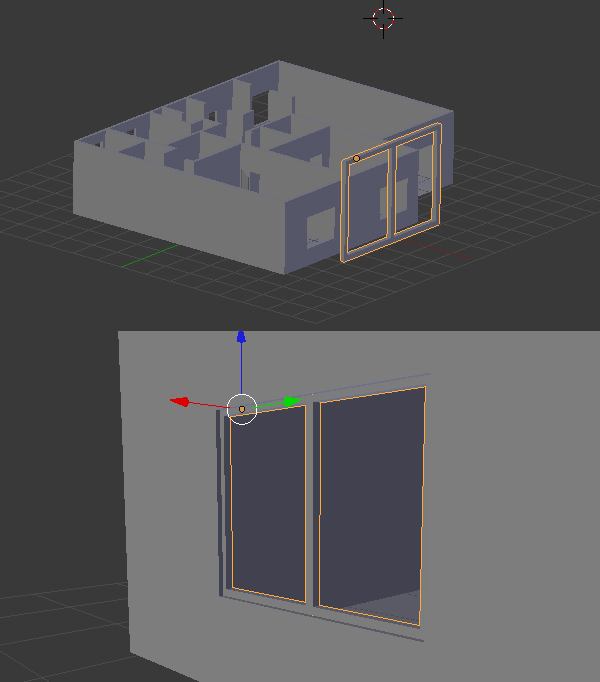 Press ‘3’ on the Numpad to get into side view and then extrude the faces as shown in the image to make the window frame. Press ‘TAB’ to exit out of edit mode, and press / on the numpad again to get back to the scene. 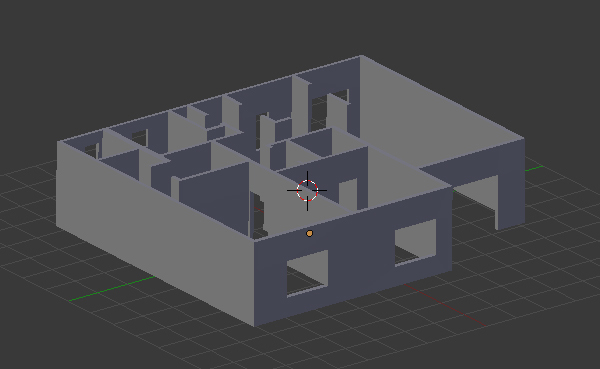 Scale and place the window frames on the walls. Make duplicates and place them according to the image. 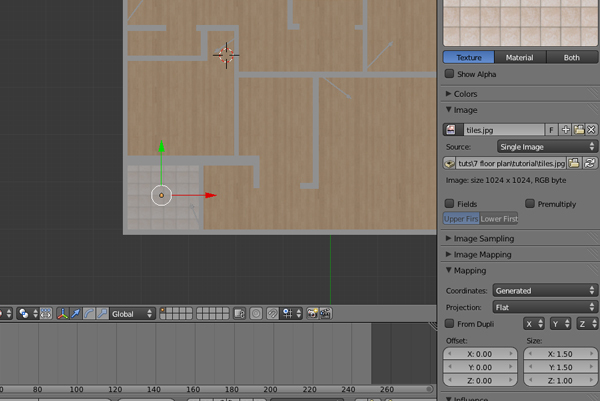 Now we will add a texture to the floor. 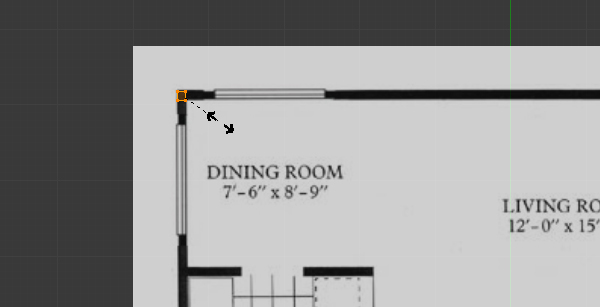 Right Click on the Floor object to select it. 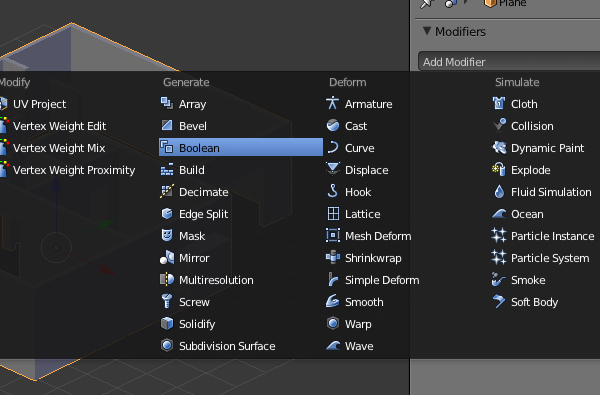 And in the Properties window, click on the ‘Materials’ Icon. 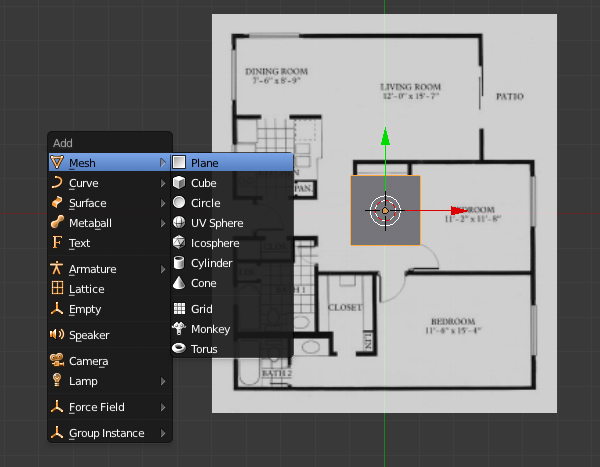 Add a New material and name it ‘Floor’, increase the ‘Diffuse’ intensity and reduce the ‘Specular’ intensity. Next we will add an image to the floor. (I got mine from Here.) 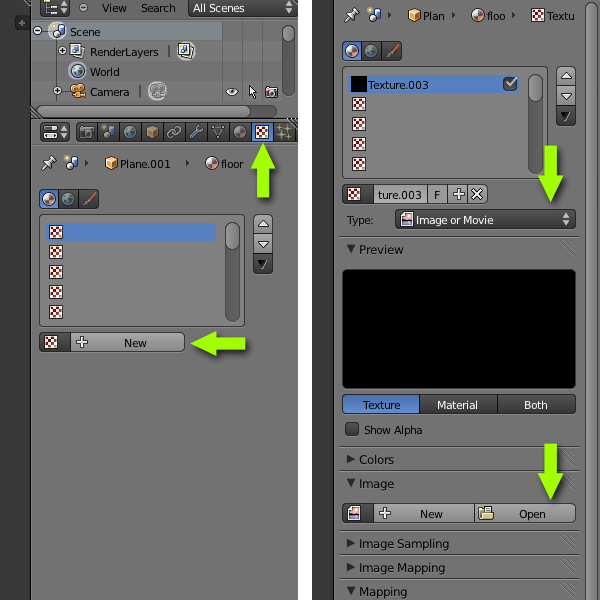 Click on the ‘Texture’ icon next to the Material icon, and then Click on the ‘New’ button. Select ‘Image or Movie’ for the Type and in the Image panel, click on “Open’ and browse for the image. You can preview the texture in the 3d View. 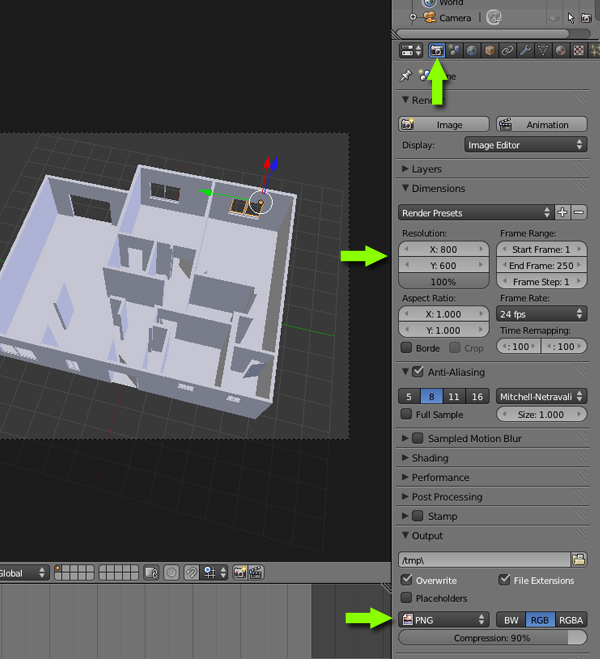 Press ‘N’ to bring up the ‘View Properties’ and in the ‘Display’ panel, select GLSL in the ‘Shading” menu (you’ll need to add some lights in the 3d view to see the texture.) Now press ‘N’ again to hide the view properties panel. 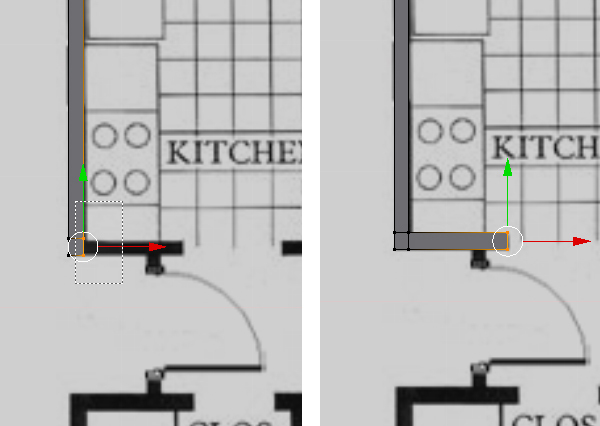 Back to the Image Texture properties, scroll down to the Mapping Panel and increase the Size of X and Y to5 or 6 depending upon your image file. 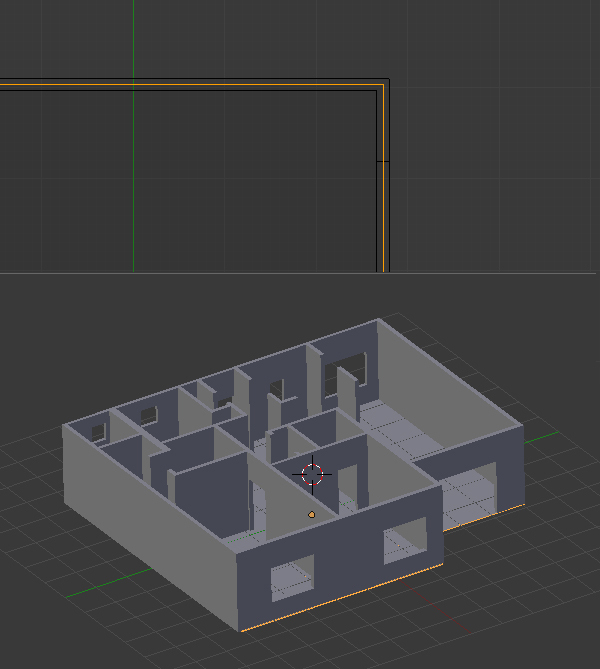 Now to add a separate floor to the Bathrooms, we will add a new ‘Plane’ and adjust it’s dimensions and place it just above the wooden floor so that it’s hidden. Apply an image, just like we did on the floor (I got mine from Here.) 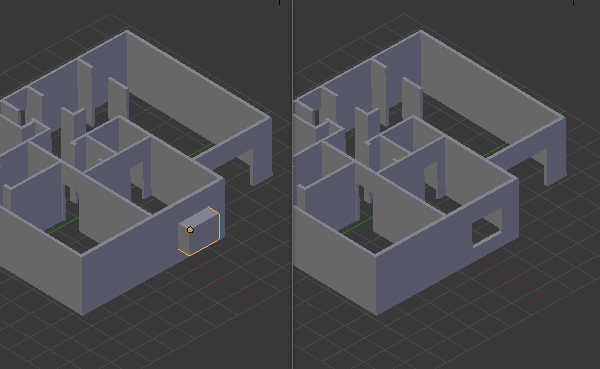 Duplicate the Plane and adjust it’s geometry by scaling and extruding for the second bathroom. 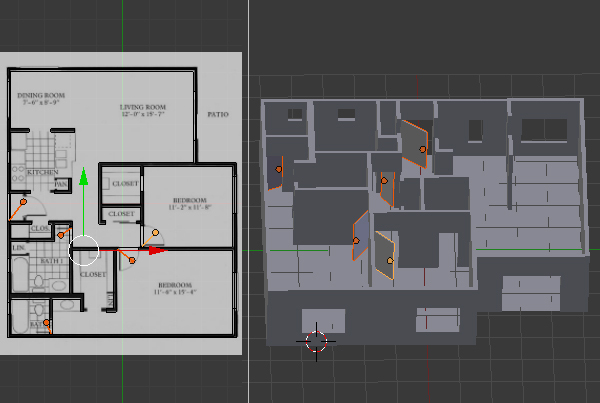 Similarly assign the materials to the windows and doors. 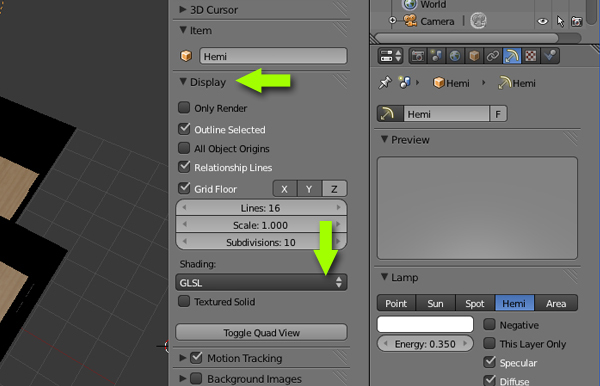 You can assign the same material to any object by selecting the material from the list. Now we will prepare the scene for rendering. Make sure you are Not in ‘Edit’ mode (press ‘TAB’ to toggle Edit mode on/off.) Press ‘7’ on the Numpad to get into the Top view, then press ‘Shift+A’ to add a camera. Rotate and place it however you like. Press ‘0’ on the Numpad to get into camera view. 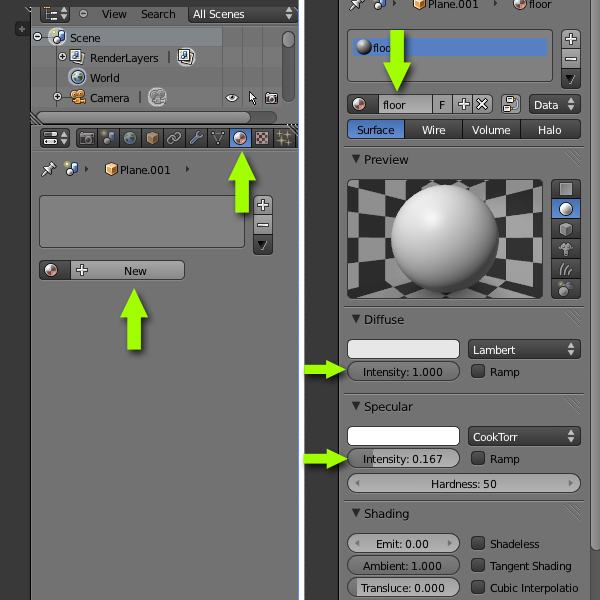 Click on the ‘World’ settings and change the ‘Horizon Colour’ to white, then turn on ‘Ambient Occlusion’ and in the ‘Gather’ panel, increase the samples to 16. In the 3D view delete any lights if they exists. 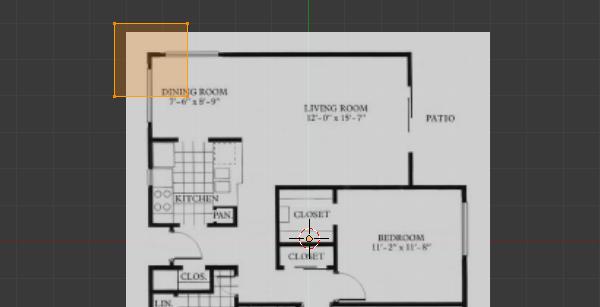 Click on the ‘Render Settings’ button in the property window, and change the Dimensions (resolution) to your desired size. 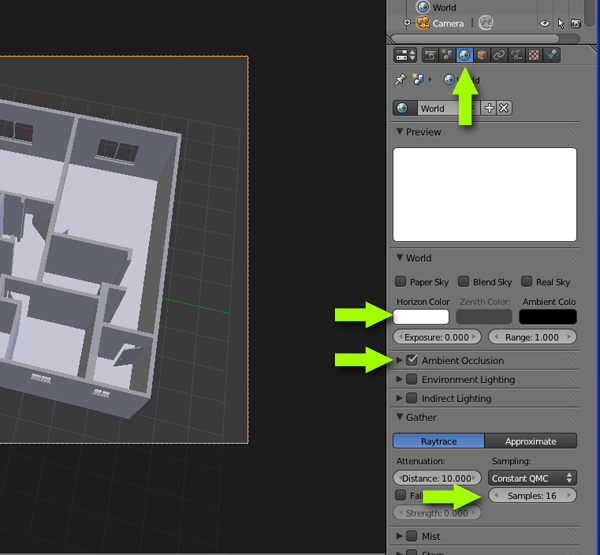 Down in the ‘Output’ panel, choose the file format for your render. 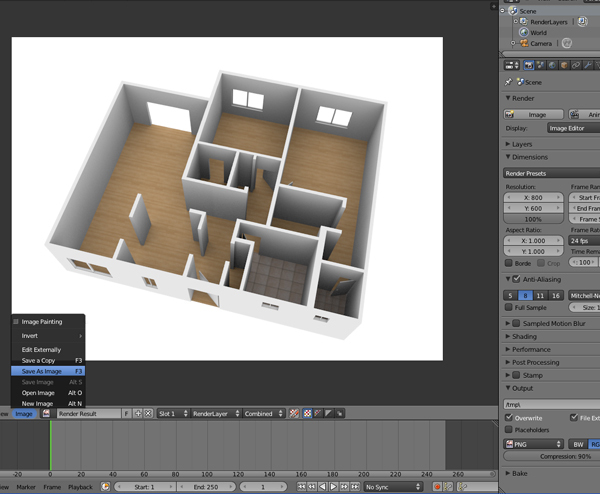 Press ‘F12’ or click on the ‘Image’ button in the render panel. Press ‘F3’ or click on ‘Image > Save image as‘ to save the image. 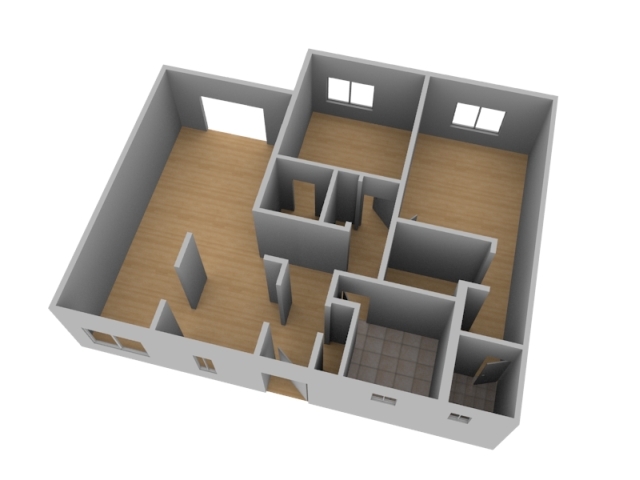 Your 3D Floor map is now ready!